Guess what time it is! If you read the title of this short post, you probably already know that the beginning of National Poetry Writing Month is upon us once again. I always look forward to NaPoWriMo every year, a chance to challenge myself and my writing and try out various poetry forms and themes from the daily prompts on the NaPoWriMo website. As with past years, I will endeavor to post a poem and movie review every day throughout April. Even so, I did start a new job recently and my free time is limited, so I’m not making any promises. I’ve been posting less frequently lately, so hopefully this will be a chance to catch up on my backlog of reviews as well. Thus, let the poetry writing begin! What makes a hero, I ask you, my friend? Some inhuman power defending good ends? Or blasting the bad guys to small smithereens? Or wielding a weapon, a sword or a shield? And those they inspire can spot them with ease. Well, I’d say the Marvel Cinematic Universe has a new MVP. No, not Captain Marvel, although she’s pretty cool too. 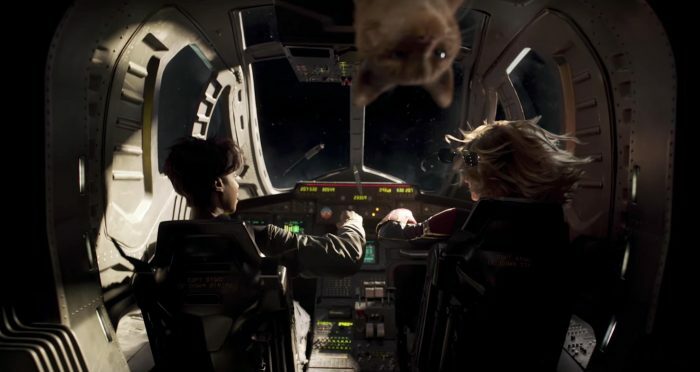 I’m talking about a scene-stealing cat named Goose (which is a Top Gun reference since Carol Danvers was an Air Force pilot). There are still endless possibilities in the MCU, many of which are opened by this very movie, but I’d be happy if every movie from now on had a cameo from Goose. As for the rest of the movie, widely touted as Marvel’s first film with a main female protagonist, Captain Marvel is a success beyond the cultural box it ticks. I had some reservations about Brie Larson playing Carol Danvers, just because of how serious she is in most of the trailers, but she is a welcome addition to the MCU, finding a healthy balance between self-assured power and typical Marvel humor. It does help that she usually has someone to play off of, sometimes Jude Law as her Kree trainer Yon-Rogg but mostly that someone being Samuel L. Jackson’s Nick Fury, who has two eyes and is digitally de-aged (incredibly well, by the way) since this is set back in 1995. Having already starred together in Kong: Skull Island and Unicorn Store, the two have great buddy-movie rapport as they take on the war between the shape-shifting Skrulls and the Kree Empire. A word to the uninitiated: Captain Marvel doesn’t try to give many concessions to the casual Marvel viewer. There are moments in the first quarter or so that are bound to leave people confused, but it picks up when events (and Captain Marvel herself) get more down to earth. The alien Skrulls, who can impersonate anyone, make for an intriguing foe, especially with Ben Mendelsohn as their leader, and the makeup work for them is much more effective than if they had been created solely with CGI. And as usual with Marvel, the effects and action are top-notch, especially when Danvers reaches her maximum power (the “Whoo!”s she makes while destroying alien ships really add to the fun). My VC wasn’t all that excited for Captain Marvel. Not being much of a feminist, she didn’t like the gender switch, since she associated the name Captain Marvel with the male hero Mar-Vell from the comics (never mind that the name originally belonged to the DC character now known as Shazam). 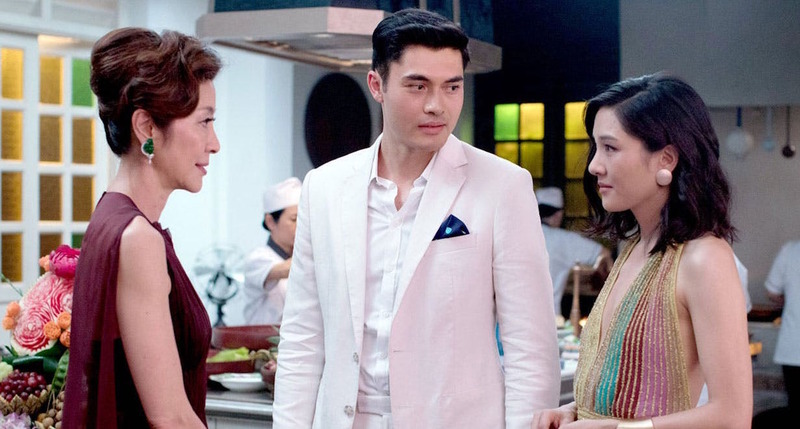 While it didn’t remove all her reservations, the film managed to win her over to accept this version of the character. I think this was not only due to the fun ‘90s setting but also its message of perseverance that is universally human, not being limited to male or female. Whether Carol Danvers is known as Ms. Marvel or Captain Marvel (neither name is actually used in the movie), she’s a welcome heroine for the MCU for reasons beyond the fact that she’s a she. Captain Marvel is a well-made origin story that sits squarely in the middle of the MCU rankings and, like last year’s Black Panther, doesn’t seem to have much bearing on the next Avengers movie following in its wake, aside from providing background for a major character. Nevertheless, it has lots of well-planned ties into the larger MCU (loved Stan Lee’s tribute, and I’ll never look at Fury and his scar the same way again!) and still whets the appetite of us Marvel nerds; the first thing I said when the credits rolled was, “At least we only have another month to wait,” to which my VC replied, “Thank God!” Now, in addition to all the hopes and fears I had for Endgame, I can add the hope that Goose will make an appearance. Fingers crossed! I would normally have posted this over a month ago, but, despite the delay, I wanted to give a little sneak peek of what the rest of the year holds for us movie lovers. If I had gotten to this list earlier, I would have included the likes of Glass, How to Train Your Dragon: The Hidden World, and Captain Marvel (Alita: Battle Angel was part of my list from last year), but these are all films that I’m eagerly awaiting. If they’re as good as I hope they are, 2019 will be a very good year for film (and these are just the ones I know of so far). Reminiscent of Hidden Figures and Selma, the trailer for The Best of Enemies promises a riveting story of the real-life friendship between civil rights activist Ann Atwater (Taraji P. Henson) and KKK leader C. P. Ellis (Sam Rockwell). With two strong leads, I hope it will help in bridging the racial division plaguing our country. In principle, I’m still not a fan of these Disney live-action remakes (The Lion King especially just feels wrong, but then again so did Beauty and the Beast), but Aladdin’s latest trailer raised my expectations. Will Smith is no Robin Williams, but he could still pull off a different kind of Genie, and the production looks sumptuous. 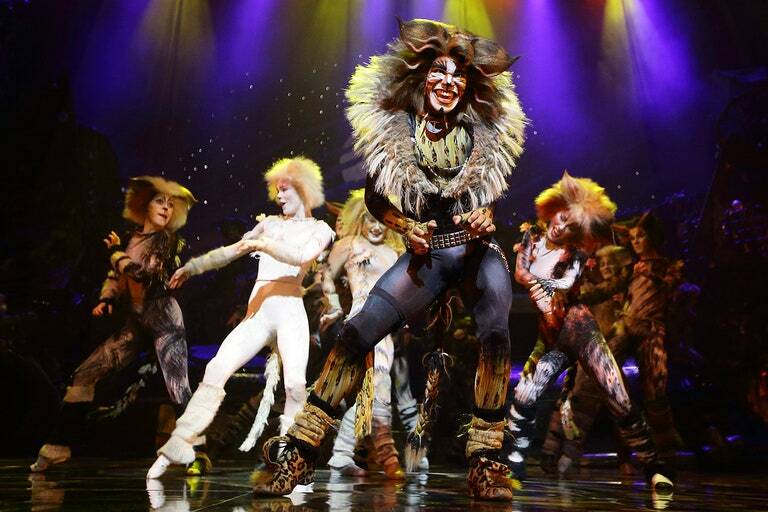 Cats isn’t really one of my favorite musicals, but if it means more musical films in its wake, I hope it’s a massive success. I have no idea how historically accurate this film will be, but I do love a good literary biopic, and my love of The Lord of the Rings will no doubt bleed into my appreciation of Tolkien. I do hope they include his faith since it was so integral to his life and work. My expectations are cautiously optimistic for this reboot largely unconnected to the original MIB trilogy. Still, it’s a promising reunion for Chris Hemsworth and Tessa Thompson, who are both due to show off their proven comedic chops, and perhaps it can kick-start the franchise all over again. I hadn’t heard of this film till recently, but the trailer has me hyped. The Beatles are quite dear in my family, and this Twilight Zone-esque what-if plot has my interest piqued. Is the first Frozen overrated and overcommercialized? Yes. Is it still a great Disney movie worthy of an equally great sequel? Yes again. The trailer certainly captures an intriguing, darker mood than the original. I really think they should have ended the series with Toy Story 3, but I guess we simply must trust Pixar to pull off one more fun, tear-jerking visit with Woody and Buzz. Makoto Shinkai might have the toughest job of any filmmaker this year: following up the highest-grossing anime film of all time, Your Name. There aren’t a lot of details about Weathering with You, but we know Shinkai excels at depicting clouds and rain and weather, so it will no doubt be gorgeous to behold. I’ll admit I’m strangely fascinated by this movie, based on a spin-off game from 2016. Pokémon fans I’ve talked to seem to have low expectations, but I really think this film could be great if done right. Whether a Deadpool-style Pikachu voiced by Ryan Reynolds will constitute “done right” remains to be seen, but I do wish this movie would defy the odds. 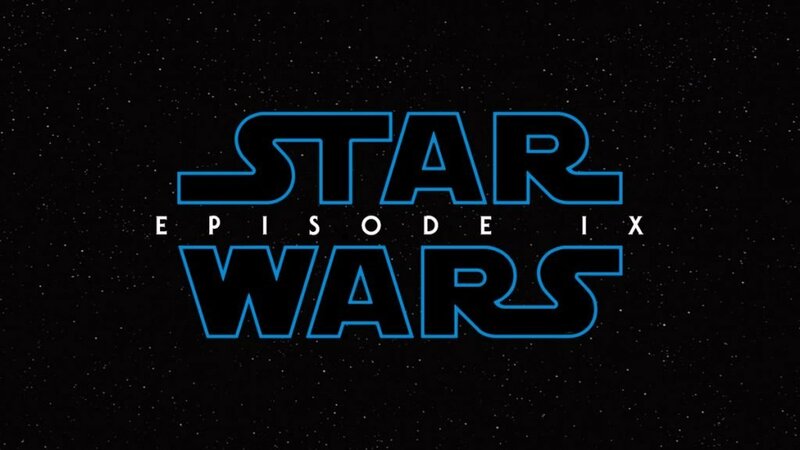 I was in the minority in loving The Last Jedi, so Star Wars: Episode IX has a doubly hard task: pleasing fans who loved its predecessor and “redeeming” the franchise for those who didn’t. I can’t wait to see how J.J. Abrams rises to the challenge. After that ultimate cliffhanger at the end of Infinity War, there’s no doubt that Endgame is the most anticipated film of the year, at least in my house. I love how mum Marvel’s trailers are thus far (except for the next Spider-Man movie’s), leaving much room for hype-building speculation. I’m hoping time travel will be involved. Thank God it’s only a month away! 1917 – Sam Mendes directing a World War I movie released in late December. Probable Oscar material. A Beautiful Day in the Neighborhood – Can’t wait to see how Tom Hanks plays Mr. Rogers in this biopic. Ad Astra – This Brad Pitt vehicle sounds like Interstellar but potentially with aliens. Artemis Fowl – Never got into the books, but Disney might be going for a new Harry Potter-type franchise. Call of the Wild – Not sure how this classic retelling will combine live-action and animation, but I’m curious to find out. Dark Phoenix – Considering I hated The Last Stand, I don’t have very high hopes for this new retelling of the Dark Phoenix saga, but you never know. Doctor Sleep – Of all the unexpected sequels being developed, a follow-up to The Shining was particularly unexpected, but since it’s also based on a Stephen King book, this might have potential. Dumbo – I wish Disney would lay off the live-action adaptations. I’m not really a Tim Burton fan, so only time will tell for Dumbo. Gemini Man – The plot sounds suspiciously like Looper without time travel, but Will Smith could make this a real winner. Jumanji sequel – Welcome to the Jungle seemed like a good standalone follow-up to the original, so I’m not sure how they’ll sequelize it with the same characters. Knives Out – An all-star cast in an Agatha Christie-style whodunit. I’m all for it! 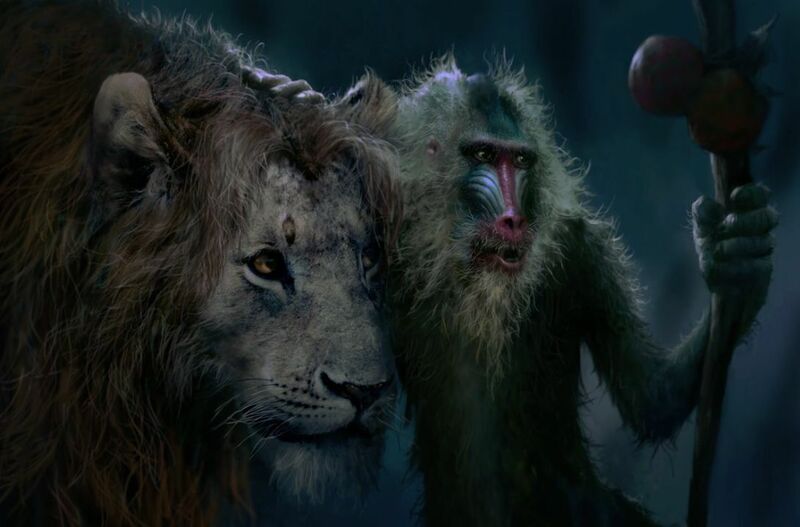 The Lion King – This isn’t even live-action, just a more realistic-looking animation! Little Women – Another all-star cast in a classic novel adaptation released in late December. Can you say Oscar bait? If it’s faithful to the book, I’m hoping it won’t need the R rating so common to Oscar-worthy films these days. Midway – A Roland Emmerich war remake could be explosive or explosively bad. We’ll see. The New Mutants – Between this and Brightburn, horror is starting to creep into the superhero genre, and I’m not sure how I feel about it yet. PLAYMOBIL: The Movie – Never played with Playmobil, but I like the animation here. Despite allegations of ripping off The Lego Movie, I’m more curious to see this one than the second Lego Movie. Rocketman – An Elton John musical that has real promise. Shazam – A superhero version of Big. Sure, why not? I’m game. 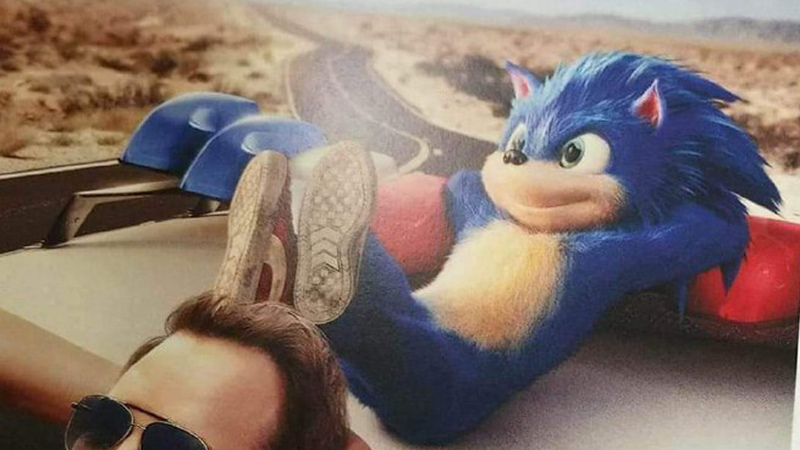 Sonic the Hedgehog – I’m less convinced on a live-action Sonic than a live-action Pokémon. Too early to tell. Spider-Man: Far From Home – I’m sure this will be another solid Marvel/Sony collaboration, but I don’t appreciate the spoiler-ish trailers before Endgame. Still, marketing is marketing. Terminator: Dark Fate – Like the Terminator himself, this franchise refuses to die. Will they end on a high note? UglyDolls – I didn’t even know these toys were a thing until the trailer, but a cast full of singers promises a fun kid-friendly musical. Us – Jordan Peele’s follow-up to Get Out looks darn scary and is getting really strong reviews. Hope it’s not too R-rated.